Deutschland 83, created by Anna and Jörg Winger and released in 2015, is a spy thriller about a young East German agent in West Germany that stars Jonas Ney. In 1980s Germany, the East German secret police send a young soldier from the East to the West as a spy. When the spy’s masters misinterpret the strategy papers he steals as a plan for an imminent western attack on East Germany, he tries to prevent the Cold War turning hot. Warning: My plot summaries contain spoilers. The major spoilers are blacked out like this [blackout]secret[/blackout]. To view them, just select/highlight them. If you’re wondering why the episode titles are so odd, it’s because they’re the names of NATO military exercises. It’s 1983. 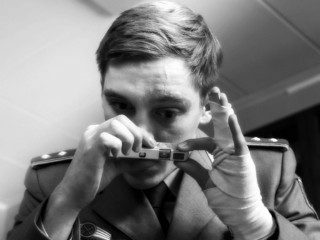 Martin Rauch is a 24-year-old East German border guard. His aunt, who works for the Stasi (East German intelligence) recruits him as a spy. Martin is reluctant but his aunt promises him that his mother will be given life-saving surgery for kidney failure if he complies. Martin is given a new identity and sent to infiltrate the office of a West German general. Martin’s mother needs to have her kidney transplant and the only possible donor is Martin. He must get to East Berlin after delivering a package. [blackout]The package is the detonator for a bomb, which is immediately used. Appalled, Martin chases the bomber and kills him. [/blackout] Martin’s friend in the Army, who has become more and more disenchanted with the danger of nuclear war, offers his services to the Stasi. Deutschland 83 has a Mission plot (see spy movie plots). Deutschland 83 is a secret history (see What is Alternative History?) Secret history is fiction that supposedly shows ‘what really happened’ or ‘what happened behind the scenes’. As a secret history, Deutschland 83 has a strong background in real events. In the early eighties, the Reagan administration’s rhetoric and weapons build up had brought Cold War hysteria to a peak, convincing many Soviet leaders that Reagan was preparing a nuclear first strike. So, when NATO launched Able Archer, an exercise designed to test procedures for nuclear weapon release, the Soviet leadership became convinced it was a ruse de guerre for a nuclear strike and readied their own missiles. Deutschland 83 dramatises that crisis. In reality, NATO noticed the Soviet preparations, but didn’t react with further escalation, reducing Soviet panic. The exercise eventually wound down without NATO realising quite how close it had come to war. Later, spies reported how seriously the Soviets had taken Able Archer. President Reagan said those reports convinced him that the Soviets were genuinely afraid of America, and that revelation persuaded him to negotiate nuclear arms reductions. Many of the other events mentioned or shown in Deutschland 83 were also real: Reagan’s depiction of the Soviet Union as an ‘Evil Empire’, the Korean aircraft shot down by the Soviets, the peace movement, the controversial deployment of Intermediate Range Missiles, and the bombing of ‘La Maison de France’ in West Berlin, for example. Deutschland 83 was also filmed at the real Stasi headquarters, which is now a museum. Deutschland 83 reminded me a bit of The Americans – it’s set in the same era, around the same events and with a similar underlying premise – Eastern Bloc concern about a NATO attack, fed by President Reagan’s rhetoric. Both series revolve around attempts to use espionage to discover NATO’s true intentions. Atomic Blonde is also set in Germany in the same era, although slightly later, in 1989, and with a plot not based on real events. It’s stylistically quite similar to Deutschland 83 with a terrific soundtrack of 80s hits and featuring retro 80s gadgets and fashion. The story in Deutschland 83 is partly based on the activities of real spy, Rainer Rupp. The main difference is that Rupp was not an East German infiltrator but a West German recruited by the Stasi whilst at university. The Stasi asked Rupp to join NATO staff, which he did in 1977. Throughout the 1980s Rupp passed thousands of documents on NATO strategy to the Stasi. Rupp claims that in 1983 he transmitted documents proving that Able Archer was not a surprise attack to his Stasi handlers, and that this prevented a nuclear war. In 1993, Rupp was finally caught and received a twelve year prison sentence. A great series. One of my favourites of the last few years. Deutschland 83 is available on Amazon US here and Amazon UK here . The producer has plans for Deutschland 86 – with Martin returning to Germany after years abroad, and Deutschland 89 – covering the fall of the Berlin Wall and the end of the Cold War. If you’d like to discuss anything in my Deutschland 83 review, please email me. Otherwise, please feel free to share it using the buttons below.